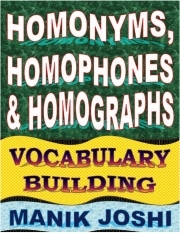 Description of "Homonyms, Homophones and Homographs (eBook)"
Homonym a word that is spelt like another word (or pronounced like it) but which has a different meaning, for example Key meaning ‘set of answer to problems’ and Key meaning ‘button on computer keyboard’. The state of being a homonym is called homonymy. In Strict Sense, Homonyms have same spelling, same pronunciation, and different meaning. Homonyms are also known as “Multiple Meaning Words”. In Wider Sense, Homonyms can also include words that have same or similar pronunciation (but different spelling) or same spelling (but different pronunciation). Note: ‘Homophones’ are also called ‘Heterographs’. Homophones are also known as “Sound-Alike Words”. Note: ‘Homographs’ are also called ‘Heterophones’. Reviews of "Homonyms, Homophones and Homographs (eBook)"